A Toronto native, Julia Mirzoev started playing violin at the age of two and a half years with her father. She then studied with renowned pedagogue Jacob Lakirovich up until she began her undergraduate degree. Julia is currently under the tutelage of Jonathan Crow, at the University of Toronto, where she plays principal positions as well as Concertmaster in the University of Toronto Symphony orchestra and the Opera orchestra. A winner of multiple first prizes across national and provincial competitions; including first and grand prizes at the Canadian Music Competition and the esteemed President’s Trophy award at Toronto Kiwanis, Julia was granted both the Toronto Symphony Youth Orchestra concerto competition first prize, granting her a series of solo concerts with the Toronto Symphony Orchestra, as well as the University of Toronto Concerto Competition prize. Julia has also performed solo with the Scarborough Philarmonic, Sinfonia Toronto, and the Canadian Sinfonietta, and will perform solo with Orchestra Toronto later this year as the winner of the 2018 Marta Hidy Concerto Competition. A participant in international music festivals, Julia has been a part of the Orford music festival, as well as the Aspen Summer Music Festival this past summer. She will be attending the Toronto Summer Music Festival this summer as a fellow, as well as the Sarasota Music Festival. 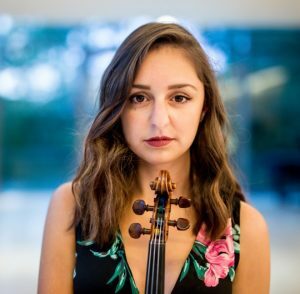 A full scholarship student due to her musical and academic success, Julia will be graduating her Bachelor’s Degree in Music this fall and will attend Yale University on a full scholarship to pursue her Master’s Degree in Music with respected violinist and pedagogue and Ani Kavafian. Julia also enjoys playing chamber music, as well as teaching.